Rob graduated with a PhD from the Australian National University (1990). He joined CSIRO as a research scientist in 1987, and is widely published in the field of hydrology. 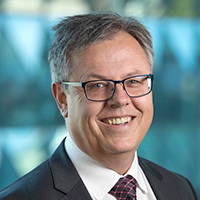 Rob served as Chief Executive of the Cooperative Research Centre for Catchment Hydrology (2002–2004) and Chief of CSIRO’s Land and Water Division (2004–2007). In late 2006 he was seconded to the Department of Prime Minister and Cabinet to design a national water information strategy. He then joined the Bureau of Meteorology in 2007 to oversee its implementation as a new Bureau service. Rob served as CEO of the Bureau of Meteorology from 2011 to 2016. During this time he was Australia’s Permanent Representative to the World Meteorological Organization (WMO). In 2013 Rob was elected a Fellow of the Australian Academy of Technological Sciences and Engineering. Rob retired from the Australian Public Service in April 2016. In January 2017, he took up a part-time role with the University of Melbourne School of Engineering as an Enterprise Professor, conducting research on climate change and water security. Rob is the Principal of Global Change Advisory, a consulting company he established focused on environmental intelligence.